When it is February, love is in the air! This year on Valentine’s Day, TATA Nx, the nutritional solutions business of Tata Chemicals Ltd., has come up with an interesting way to connect with consumers. Zero Sugar, the first product by TATA Nx, is a 100% natural* sweetener made from lactose, steviol gycosides (naturally occurring extracts from stevia leaves) and a fruit extract. It has low glycaemic index (GI)^, which makes it an ideal sweetener for people who have been advised to reduce their sugar intake or avoid sugar, and for people who are calorie conscious. Stevia is said to be 300 times sweeter than sugar and has zero calorie. TATA Nx Zero Sugar is running a 10-day long social media contest where consumers are encouraged to “Propose Stevia” and win exciting prizes. 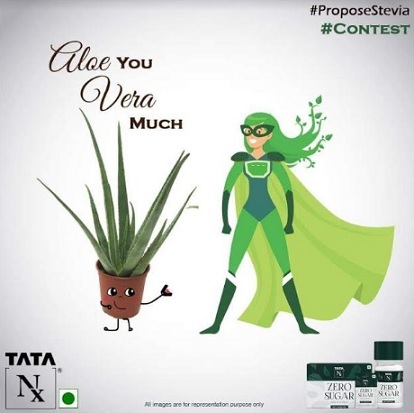 The contest will end of February 14th and for this contest, TATA Nx has created two cute characters - the Stevia Man and the Stevia Woman. Every creative for the campaign has been designed keeping in mind the value proposition of being “100% Natural” and hence there is “natural object” making a “self-styled” proposal to Stevia. For instance, you will find a cashew nut saying “I am NUTS about you” and a rock saying “I want to ROCK your world”. The campaign is getting a stupendous response on Facebook and Instagram and consumers are participating by sending their innovative and quirky proposal to Stevia man/woman via video and text messages. Commenting on the campaign, Anangla LKR, Marketing Manager, Tata Chemicals Ltd. said, “Today’s hectic lifestyle demands a lot from the body and to stay healthy, one requires the right nutrition. TATA Nx is a new-age range of nutritional solution specially crafted for today’s health-conscious generation. Our efforts are concentrated on creating mass awareness, and our biggest bet to create mass awareness is the digital media. With Propose Stevia campaign, we are creating deeper engagements with our target audiences to spread awareness on Zero Sugar, Stevia and natural sweeteners at large." Stevia Superheros were first introduced by TATA Nx in 2018. These characters were conceptualized with a big idea that everyone who adopts the natural sweetener - Stevia, is a Stevia man/woman. These Stevia Superheros are change agents who will advocate the use of natural sweeteners as a replacement to sugar. The campaign was well received then and hence this Valentine’s Day the same characters have been reintroduced and they are getting a lot of love and adulation even now. For more information on this campaign, please visit: https://www.facebook.com/tatanxindia.